and then using a blending tool to ink the inside of the jar in hawaiian shores. which I stamped onto coordinating dies. This is stunning Leigh!! 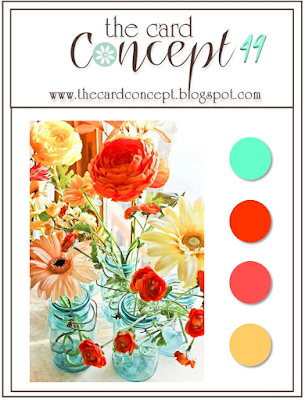 I LOVE your gorgeous bouquet and mason jar! Ooh it IS so pretty! Love thason jar idea. This card is so you, Leigh! Bright, cheery, colorful, all hallmarks of your style. How cool that the PTI sentiment fit in the Lawn Fawn jar. Don't you just love it when that happens?! An all-around gorgeous card! Beautiful! Fabulous take on the inspiration. Thanks so much for playing along with The Card Concept this week! Your vase of blooms is gorgeous!You really captured the colors from the photo.Thanks for joining us at The Card Concept! SO pretty!!! I saw this card somewhere in blogland and it popped for me, gorgeous!!! This is so pretty, Leigh, such a lovely bouquet and vase! This card is just gorgeous Leigh! Beautiful Leigh! I love how perfectly that sentiment fits onto the jar. I'd love a bouquet like this!! Omgoodness, this is beautiful! Those flowers are so bright and beautiful! You really nailed the colors from the inspiration photo here. And I adore that jar! Always a sucker for a good mason jar, and this one is tops! Leigh this is so pretty, infact i think this is my favorite card of yours. Everything on it is so perfect. Love these bright colors! Gorgeous!! It's your card that's fabulous, Leigh. I love everything about this, Leigh! Just gorgeous! The color is so brilliant and it feels so cheerful and uplifting! Thanks for playing along with us over at The Card Concept! You totally nailed this one Leigh! Gorgeous!! Thanks so much for playing along with us at the Card Concept. Wow! These flowers are beatiful! Great contrast with the mason jar too!